Your front room, hotel or place of work, wherever you want it – We bring the Spa to you! Staying in is the new going out! Ideal for pre wedding chill-outs; Birthday celebrations; Hen parties; Divorce parties; Baby showers or just a fun girls night in! 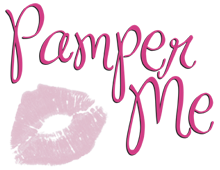 For a Girls Night In Pamper Party please allow 3-3½ hours depending on number of guests and treatments chosen. 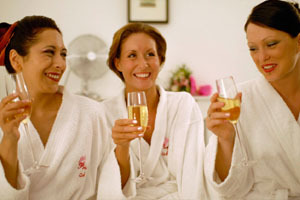 The Girls’ Night In package costs £45.00 per person for a minimum of 4 guests. On receiving your deposit this will secure your booking, your Pamper Me pack will then be posted out with invites and consultation forms for you and your guests. You will then need to return the completed consultation records as soon as possible. A few days prior to the engagement we will call you to confirm everything. All party guests will be handed a headband, robe and disposable slippers and will each commence with a relaxing aromatherapy foot spa, and face pack, followed by their individual treatments. We strongly recommend that you do not consume any alcohol prior to and up to 24 hours after treatments (manicures and pedicures do not apply) due to the intense detoxifying process that your body is going through-it could be dangerous. However, dipping of the chocolate fountain is compulsory throughout! All robes, and non disposables etc are returned and packed away, we give a general tidy up. Leaving the hostess and party guests feeling refreshed, revitalised, relaxed and PAMPERED! !